Bringing together a diverse group of panelists to speak about these issues gave us an expanded view into the promise of collaboration, as well as further insight into where gaps are still causing us as a community to not be able to move forward. 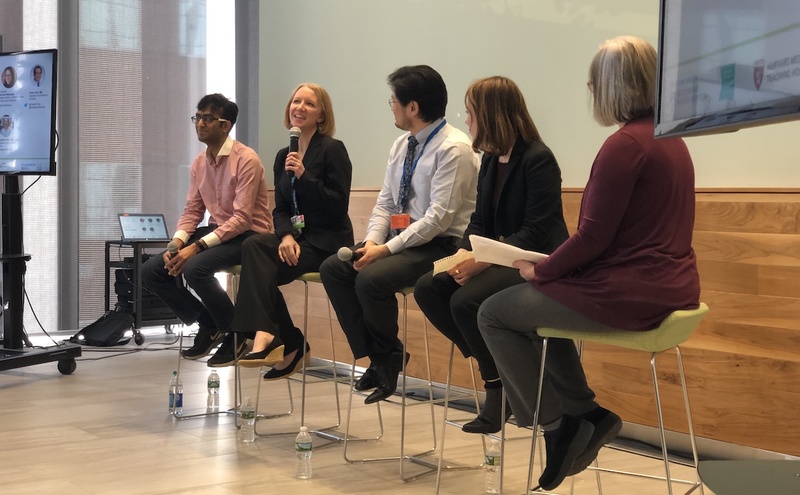 The panel speaking on "Solving the Crisis with Opioid and Pain Innovations"
“We need to build collaborations across the various touchpoints, where we can track patients throughout all stages of care,” stated Bommaraju from Marigold Health. 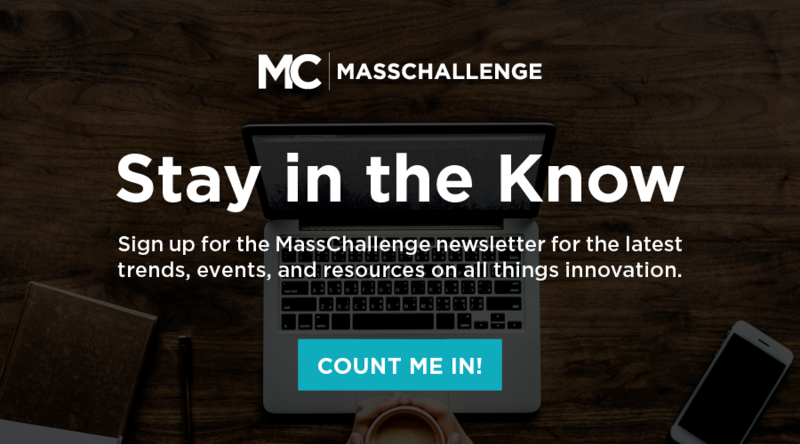 Marigold Health, a member of the 2019 MassChallenge HealthTech cohort, is a mobile platform giving patients text-based group support, while using artificial intelligence to scale existing behavioral health providers. “Data is power, and the various points of connectivity are crucial in health care. The crucial factor is how do we build these collaborations and connect these startups,” urged Bommaraju. 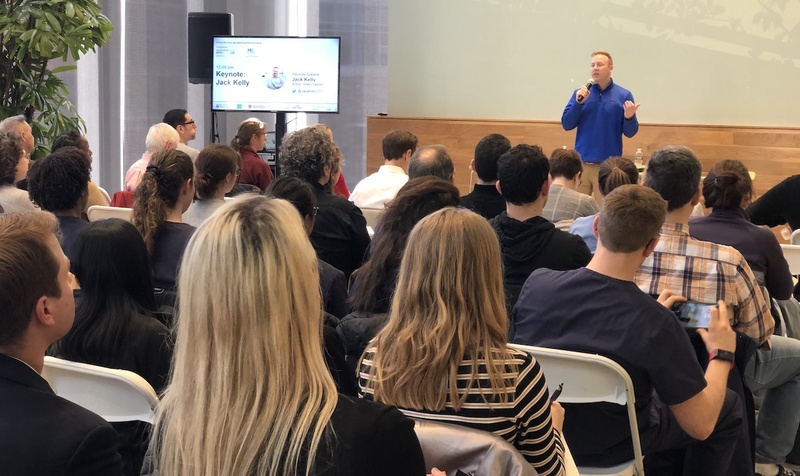 Bommaraju also highlighted other members of the MassChallenge HealthTech 2019 Cohort that are leading the charge in this space, such as DynamiCare Health, a technology platform that addresses substance use and rewards healthy behavior. He pressed on the importance of AI-based voice assistants and chatbots such as CareAngel and Bouy Health as ways of engaging patients in their existing continuum of care. “We should leverage all of the data we have, breakdown the silos and actually make those connections,” urged Price. Cities like Boston, which are fortunate to have not only many large academic medical centers in close proximity, but affiliations with leading academic institutions and leaders in the tech space, also have the ability to share their models with those in more rural or isolated areas in order to help them address their issues on a local level as well. Bommaraju shared specifics around how the startup is making strides towards improving patient support during their recovery. He explained that users of the application can join groups with anywhere from five to seven peers, open 24/7, and can talk anonymously without the fear of stigma or judgement. “Our mission is to drive patient engagement while improving care,” explained Bommaraju. “We have AI algorithms that can identify if users are at risk of relapse or suicide ideation.” Working closely with providers, Margiold Health can help track patients, gain further insights into their progress and assist in identifying anyone who may need more attention. The City of Boston is a focusing on the impact of opioid addiction on the younger generation. The Youth Substance Use Prevention Strategic Program aims to assess the capacity of existing youth substance use prevention services, identify gaps and best practices for expanding youth prevention service capacity and develop actionable recommendations for future investments in youth substance use prevention services that are culturally competent and linguistically appropriate. “We are educating those who come in regular contact with young people on how to teach positive coping skills, how to talk to them about opioid medications, and helping them overall interact with these young people,” stated Maniates. The emphasis on the younger generation came through Q and A with the audience, in which many answers emphasized how hospitals and cities are making sure this generation is correctly educated, supported and heard when it comes to opioid and other pain medication. “There must be further implementation in schools to reach kids at a younger age. Programs such as D.A.R.E did not work,” urged Suzuki. Many within the system are still concerned about equal access to care, and the socioeconomic divide that causes a lot of the underlying issues and disorders which can then transform into substance abuse and addiction. “Until we change the communities that our patients are living in, which produce chronic stress, we will not be able to address addiction. We need to address violence, racial inequity, and other issues in order to address this crisis,” stated Price. His journey began at 13 years old, where he was prescribed a large amount of Percocet after separating his shoulder in a hockey incident. Kelly highlighted his personal lack of understanding around opioid pain, the lack of knowledge and transparency that his doctor had into his family history of addiction and substance abuse and his eventual transition of becoming “an addict” within a six-month window. But Kelly was luckier than others. He shared his experience and eventual transition to recovery while staying at the Boston Rescue Mission. Kelly urged the audience of providers and caregivers to offer support through hope and compassion to patients like him. Stigma won’t help tackle the issue. Talking about it is the first step towards tackling this massive challenge in health. So how do we move forward? Many lives have been affected and it will take continuing collaboration, giving compassion, and connecting and supporting the community to see improvements, and it all begins with an open dialogue around this issue. “I see hope in the fact that people are openly talking about these issues,” explained Maniates. 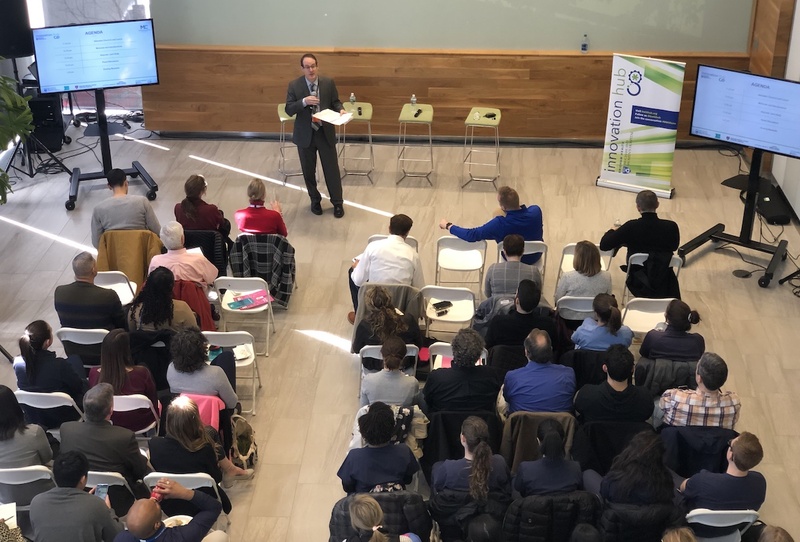 Announced at the event were two new initiatives that will support the various internal innovators, projects and initiatives both at the Brigham as well as the broader Boston community. “Pain and opioid related issues cut across multiple departments here at the Brigham. Were officially announcing the Brigham Program for Opioid and Pain Innovation and are actively recruiting a senior program manager to help us lead the initiative,” explained Weiner. Working closely with iHub’s Brian Mullen, and various internal leaders at the Brigham, this announcement represents a two-year journey of convening various innovators in the space here at the Brigham to collaboratively work together, move forward toward better patient care, and work toward the goal that if you come to the hospital with an acute painful condition that you will be treated with compassion, and not be put at risk for opioid use disorder. Weiner was also excited to announce donor commitment from the Donald C. McGraw Foundation to support research for innovative opioid and pain related projects here at the Brigham.